May 15th, we celebrated with Sr Anita on her Golden Jubilee of Profession. To continue the celebrations for the "patronal" festival of the Holy Spirit at the Priory, we invited the congregation to join us for refreshments after the Eucharist, before then sharing Sunday Dinner with the Sisters from thenearby Branch Houses. The Octave brought us to the celebrations of Queen Elizabeth II's Diamond Jubilee. We joined the national celebrations courtesy of the television coverage and again welcomed the Priory congregation to the refectory, this time for a Big Lunch. Our Infirmary staff organised a red, white and blue garden party for all Sisters on the Tuesday Bank Holiday. Ecclesiastically and domestically we have now returned to Ordinary Time. 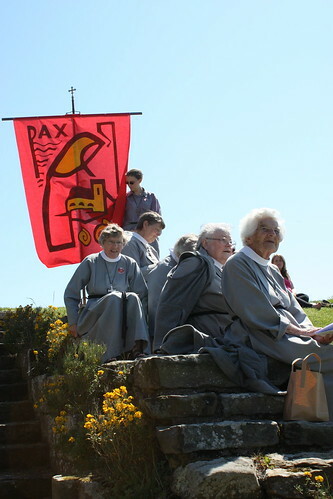 The Pentecost Newsletter is now available and includes more news from the Order, plus the obituaries for Sisters Heather, Stella Mary and Mary Margaret.